Using the NASA data, which is about mid-range in the major players, Tamino finds that the overall average warming rate since 1985 in the Arctic, at 6.48°C/century is fully 3.4 times as fast as the global rate since 1985 of 1.90°C/century. Looking at the seasonal data, the winter Arctic warming is 5.8 times as fast as the global rate, while the summer Arctic warming is only 1.4 times as fast. Tamino suggests that the main reason is that with a fair bit of ice around the air temperature struggles to get much above 0°C in the summer. That article also says that winter sea ice volume in 2017 had dropped an astounding 42.5% since 1979. Even more astounding was the summer ice volume, which had dropped 80%. 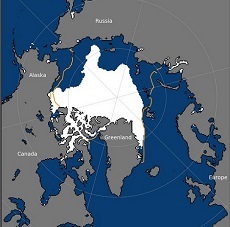 This article from NASA says the summer ice has retracted 40% in area during the summer minimum since the 1980s. Could be heading into new territory. 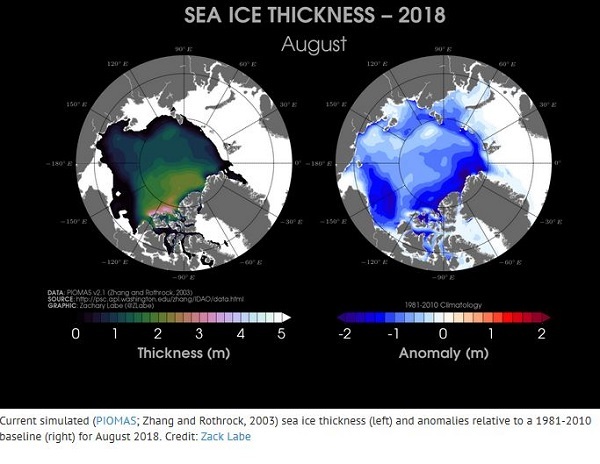 B4.1.There is high confidence that the probability of a sea-ice-free Arctic Ocean during summer is substantially lower at global warming of 1.5°C when compared to 2°C. With 1.5°C of global warming, one sea ice-free Arctic summer is projected per century. This likelihood is increased to at least one per decade with 2°C global warming. Effects of a temperature overshoot are reversible for Arctic sea ice cover on decadal time scales (high confidence). The report also ignores “wild cards” in the climate system, or self-reinforcing feedbacks, said Veerabhadran Ramanathan, a professor of climate sciences at the University of California, San Diego. 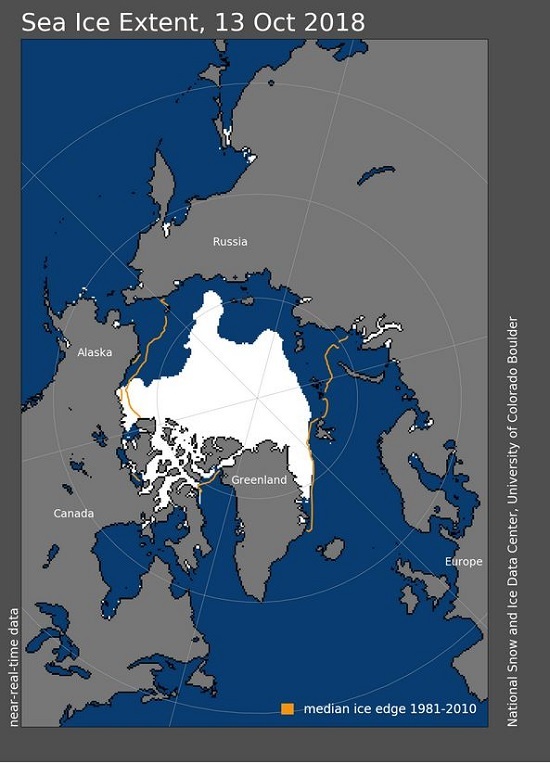 That includes thinning Arctic sea ice, which allows the ocean to absorb more heat, causing even more ice loss and diminished reflectivity in the region, he said. Such feedback loops have a real possibility of pushing the planet into a period of chaos that humans cannot control, he said. 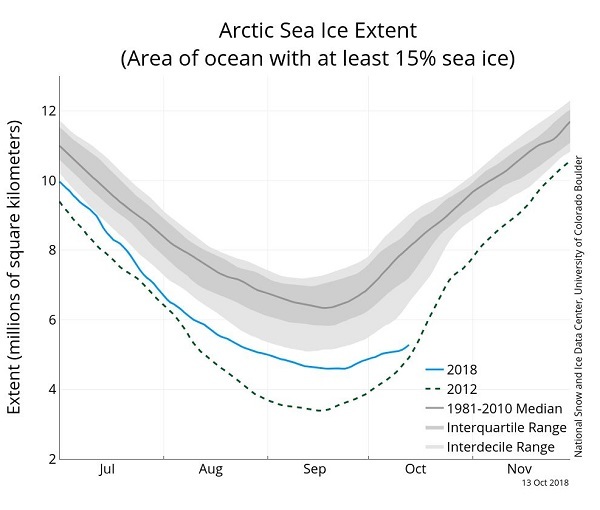 This article Here’s what vanishing sea ice in the Arctic means for you summarises the implications of sea ice pretty well. The albedo effect is just a fancy expression for a very simple concept: white surfaces like ice and snow reflect about 80 percent of the Sun’s energy back into space. That allows us to keep cool. But if those white spots disappear, the darker ocean and land will absorb 90 percent of that heat, accelerating global warming. 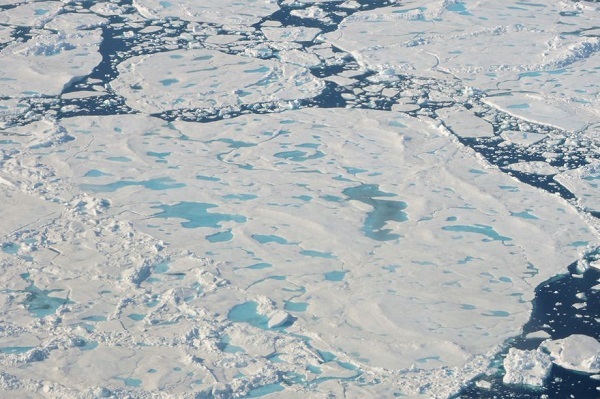 The albedo effect due to vanishing sea ice is already responsible for about 25 percent of global warming, according to Jennifer Francis, a research professor at Rutgers University’s School of Environment and Biological Sciences. Secondly, more open seas means bigger waves and more erosion, especially during storms. Just this winter, as ice in the Bering Sea shrunk to record levels, huge waves pummeled the town of Diomede, engulfing homes. 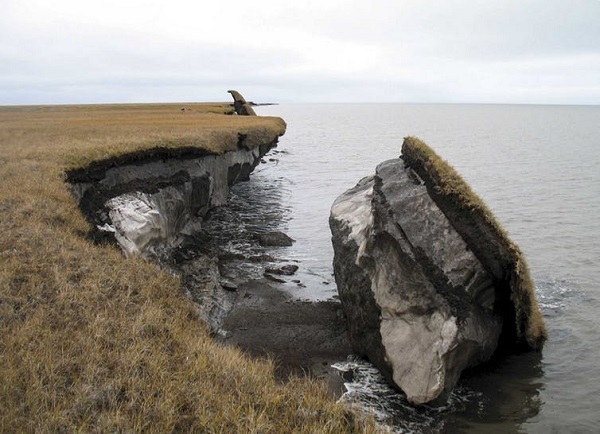 Erosion is also forcing the 400-plus residents of Newtok, Alaska, to relocate. Third, a warming Arctic has been shown to cause more extreme weather – recent research showed that when the Arctic is unusually warm, extreme winter weather is two to four times more likely in the eastern US. Alaskan temperatures have been as much as 21°C above normal, while lower latitudes have frozen from cold air displaced. 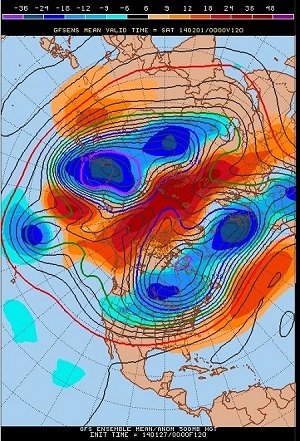 Europe and the NE of the North America seem to be developing a pattern of blazing hot summers, cold winters, storms and floods. Then there is the weakening of the jet stream and the slowing of the major ocean circulation system known as the Atlantic Meridional Overturning Circulation ( AMOC), which I’ll look at again in a separate post. Finally, there is the liberation of GHG’s especially methane through permafrost melting and ocean clathrates. Serreze says there is a term Arctic amplification to cover the whole phenomenon. Unfortunately the effects are not smooth and linear, subject to predictable measurement, which is the kind of science the IPCC likes to crystallize in its advice to policy makers. This leads to the burying from sight of significant global risk and a complacency that could mask nasty consequences. 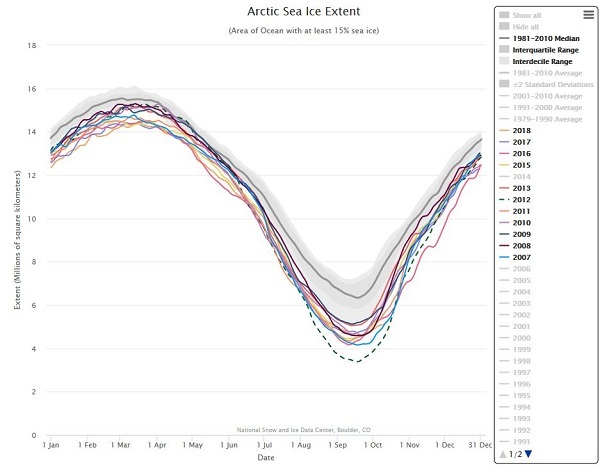 Update: I forgot to mention Pollution is slowing the melting of Arctic sea ice, for now. A study has found that human-produced aerosols are slowing the melting by a massive 23%. Sorry for a non scientist stupid question but does this show up in sea level recordings ? JAL: Arctic sea ice floats on the surface of the world ocean because the density of ice is lower than that of sea water. Archimedes principle predicts that, if you start to freeze fresh water in a bucket the level of un-melted water in the bucket stays the same until the surface of the water is covered in ice. The same is true when you melt the ice. RealClimate is an excellent resource. Of course if you’re a RWNJ you’ll believe that because it’s run by scientists involved in actual climate research it can’t be trusted and Watts Up With That has more gravitas, but within its pages will be found most of the answers to Jumpy’s questions. Sea level rise is complicated. Here are a couple of explantions and demonstrations. You might like to take notes Jumpy, I know you are going to aske the same question again. I know also, Jumpy that in the past you have gone with the climate scientist scam conspiracy thinking. To get a perspective on just what climate science achieves other than vainly alerting politicians to our perilous emissions policies, I invite you to down load an app (don’t worry…it is free…and will not bight your tight wallet) called “windy dot com”. You will see in this app the culmination of the work of all of the worlds meteorologists, climate scientists, weather saltelites, universities, and, and, and… In this app you can see every air movement at every elevation continuously and with projections, temperature rain sea currents sea temps ,,,,,,,,,,. Every sea going vessel uses this information to get its cargo safely to destination. Every aircraft that leaves the ground depends on the knowledge visible in this app, every government service not in airconditioned encapsulation uses this information, farmers depend on it (well most farmers…there those Liverals in the farmers federation who are blind), on and on. This is the spectacular scientific achievement that completely demystifies climate and weather. 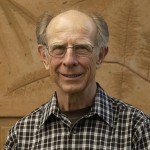 It was only a handfull of years ago that there were those nutters who were arguing that there their hand done graphs in one spot were proving that global warming was fake, they were completely oblivious to the immense and complete resource of biosphere knowledge that has been available to the scientists who are sound the alarm on global warming. The likes of jonova stil gabble on about minor modifications in the local weather station data at …Bankstown..or anywhere some how prove that climate science is a fraud. Its tim e to demonstrate absolutely the shear stupidity of these denialist progress blockers, the biggest bunch of whom are in out very Parliamentary government. This app is endlessly useful and accurate. I use it to see what my boat in Stellendam in the Netherlands is experiencing while I am not there. You can look at any location in the Barrier Reef to see what the local weather, wind, wave, tide, temperature, rain, humidity, is or will be. And you can do that for any spot on the planet. If you are a famer you can keep an eye on the conditions your stock is coping with, or wil be for a period in to the future. Why can’t science say what the temperature will be in your front yard ten years from now? Mostly only because they don’t know for sure where you will be living at that time, but also the biosphere is a chaotic system which is change continuously. having said that science can make a pretty good guess on the most probable temperature in most places will be based on history and good modelling projections. There is no Climate Mystery, there is only there earths biggest anomaly, humans and their environemental intervention. Jumpy, I didn’t mention sea level rise, because it’s not a significant direct effect of Arctic sea ice melting. John is right, in general tems floating ice that melts does not lift the level. Floating ice is roughly 9/10ths below water, from memory, and water is unusual in that it contracts slightly in volume when it changes from solid to liquid. Concerning the residual, more recent research indicates that thermal expansion may have been underestimated. When ice sheet melt takes over as the main contributor, as it surely will some time this century, we’ll be in big trouble. In the real world, as BilB’s links point out,there are other factors, such as ocean and wind currents and whether the land is rising or sinking at any point. Another that I find interesting is the magnetic pull between the Greenland ice sheet and the surrounding water. Ditto for Antarctica, but it doesn’t matter as much there. I forgot to mention in the post – Pollution is slowing the melting of Arctic sea ice, for now. Did you dowload windy.com , Brian? Give it a go, you’ll never need the weather channel again. It demonstrates just how complete our weather knowledge is. Truly awesome. It makes me appreciate even more the spectacular achievements of our climate scientists such as Roger Jones. Posted at The Guardian, dated Sep 13, is an article headlined The strange science of melting ice sheets: three things you didn’t know. The wider picture is that we are generating enough GHGs to initiate multi-metre SLR, and the factors mentioned in the article are marginal. The equations then in wide use accurately described the trend in average sea level worldwide—a rise of about two millimeters per year in the twentieth century—but couldn’t explain why actual observed conditions in many places did not conform to that average. In fact, some places on Earth could find the local sea level falling. This is because the sheer mass of glaciers generates gravitational pull and draws water closer, raising the sea level nearby. As glaciers melt, though, this pull weakens and the adjacent sea level falls. At locations far from a given glacier, the most noticeable effect of its melting will indeed be the increased volume that meltwater has added to the sea; closer in, though, decreased gravitational pull becomes the predominant effect. Much depends on which ice sheets melt. If glaciers near only one pole collapsed entirely and those near the other pole didn’t melt much, the gravitational effects (and resulting sea-level drop) would be concentrated at that end of the world; if glaciers near both poles melted, sea levels at high latitudes would fall, while seas near the equator would rise at a much greater rate than the global average. I think sea level rise is much more complex than most people know. Geoff M, that’s all very well, but it seems to me that the possibility of either Greenland of Antarctica melting entirely when the other is unaffected is improbable to the point that you could rule it out as a future prospect. I can’t lay hands readily on what happened during the Eemian, but would lay odds that both Greenland and Antarctica contributed a fair proportion, plus a bit from East Antarctica. That said it is an interesting article. Scientists do now have a couple ice sheet model which gave 1.4m to Greenland and 4.4m to Antarctica. Problem is another bunch of scientists looking at ice cores reckon Greenland contributed 5.1m. That’s on a quick look, I could be wrong. I’m not suggesting that either (or both) Greenland or Antarctica ice sheets will melt entirely in a relatively short timeframe (or by year-2100), and I would think no one else would be suggesting that. My point is that gravitational effects of the ice sheets appear to be significant, and do apparently matter. Proportional melting of ice sheets will affect sea level rises proportionally, dependent on proximity to the ice sheets that are melting. As the Harvard Magazine article says: “actual observed conditions in many places did not conform to that average” – the inference of the article is that this is due to local gravitational anomalies. The GRACE satellite system measures gravitational anomalies of planet Earth. GRACE has been used to measure the thinning of ice sheets. Geoff M, I completely accept that, but the differences they are talking about are inches rather than metres. The bigger problem is that the IPCC are suggesting that SLR by 2100 could be in the order of 22 to 77 cm for 1.5°C, whereas it could be anything up to about 5 metres. See my next post Cool patch below Greenland is bad news and the 2016 Hansen paper it links to. …but the differences they are talking about are inches rather than metres. In fact, some places on Earth could find the local sea level falling. This is because the sheer mass of glaciers generates gravitational pull and draws water closer, raising the sea level nearby. As glaciers melt, though, this pull weakens and the adjacent sea level falls. Some places on Earth “could find local sea level falling” (in my estimation at least) is a substantial local/regional counteracting effect to the IPCC’s estimates of average global SLR of “the order of 22 to 77 cm” for 1.5°C by year-2100. Furthermore, regions distant from the melting ice sheets could see significantly greater SLR than the global average. So I would disagree with your statement that: “they are talking about are inches rather than metres“.